Posts related to Brazilian Jiu-jitsu and Judo. Is starting judo or jiu-jitsu at age 45 too late? I started around 38 with jiu-jitsu and I didn’t have any grappling experience. 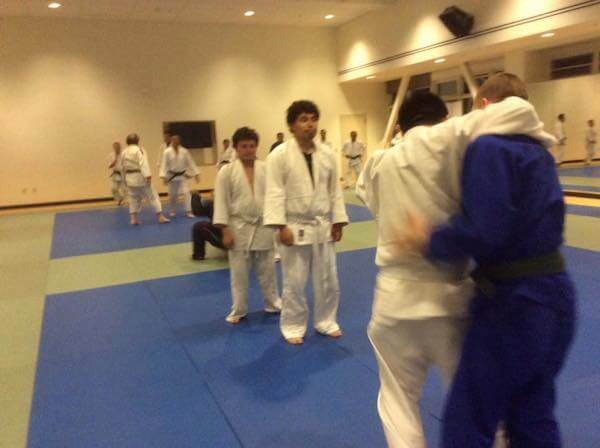 After a year I wanted to learn judo too, so I moved to a school that did both. I currently train both although I spend more time doing BJJ. What are your concerns? Getting hurt? You can get hurt. These activities are not as safe as playing table tennis, but many sports are dangerous. I have received a few injuries mostly minor, but a few that took me out for a while. You got to watch out, especially for the big and strong guys. You also have to watch out for your ego. Cross train: workout, do other exercises. It takes a lot of time to learn these martial arts and there is always something to learn regardless of your level. In judo the term for a black belt is “shodan” which actually means beginning degree. I have heard plenty of blackbelts in jiu-jitsu say the same thing. Think long term. But 45 is not that old. Initially it’s all going to be new and there are so many movements which you aren’t used to. I train quite a bit now. In the past I was doing 4 days a week with 2 of those days being for a mix of judo and jiu-jitsu. Now I am doing like 6 days a week for jiu-jitsu and 2 days a week in judo when I can. Most people I know who do jiu-jitsu say judo is harder. I spend more time doing jiu-jitsu so I am not really sure what the judo folks think of jiu-jitsu. I know my judo teacher would sometimes make comments like jiu-jitsu is more for “animals” – as there are fewer rules. Or you have to use technique in judo where jiu-jitsu is all muscle. I don’t agree with that. I think that was his bias. I see it the same way and that’s that it is all technique, but strength is an attribute too. Strength and size matter in both. If they didn’t matter there wouldn’t be separate weight divisions in competitions. You get impact with judo cause you get thrown and sometimes it’s hard and unexpected. It’s a little faster and probably demands better conditioning than BJJ. Jiu-jitsu is slower so you tend to get less impact and collision, but you can get strain and injuries too. But again make sure you start slow and learn how to fall. Find a good school that is looking out for you. I also recommend doing some yoga to stay limber, but not intense yoga. I do about 15 minutes of yoga for jiu-jitsu a day and I think it helps balance out my body and then a few days a week for strength training. I think all of those things help. There are a lot of guys in my current jiu-jitsu school who are in their 40’s, some in their 50’s, a guy who is really strong and agile in his 60’s and even a guy who is 70 (in the video above). Just start slow and take it easy. Find a good school for either one and tell them your concerns. I think for starters judo is better to learn as it is a little more well rounded. You learn the basics like falling, plus judo is where BJJ came from, so I think it’s good to know the tradition. But either one could work depending on what you want. Also I would do some cross training with other exercises. Here’s a tip for judo to remember. Remember that when you fall or get thrown because if you don’t you will get a bit of whiplash on your neck or hit your head on the mat. And as one teacher said, “tap early and tap often”. And as I always tell myself, “play smart”. So here are some tips again to repeat over and over again in your head. This is at Axis jiu-jitsu in Fukuoka. On some of the weekdays we do an abdominal workout with about 5 different exercises and on this day it totaled about 500 repetitions. The larger the class the more sit ups we do. It’s a really awesome core workout. I think my stomach actually got a little more cut from this, the intermittent fasting I do, and the exercise I sometimes do when I am fasting: jiu-jitsu, riding my bike 12km a day, working out, etc. Here’s a video I made about practicing yoga for jiu-jitsu and martial arts. And following the video are 8 reasons why you should practice yoga or at least consider it if you train martial arts. Increasing your flexibility is a perk in jiu-jitsu. There are a lot of factors that can make in difference in BJJ or judo and flexibility is one. The others are strength, weight, speed, and skill. Maybe you can do rubber guard, avoid painful stack passes or just sneak your legs into just about everywhere. Many people that I roll with tell me that I am pretty flexible. I think I am somewhat, but I am not extremely flexible. I know people who are definitely more. But the thing is you can always get more flexible if you focus on it and you are patient. And remember if you don’t use it you’ll lose it. I started to lose some flexibility in my knee. When I first started BJJ I realized I couldn’t kneel without pain. Closed guard escapes and just seiza hurt. I thought it was arthritis from injuries and old age, but I had stopped doing certain poses in yoga too. So I started to do deep squats, some kneeling and then gradually I was able to kneel without much pain in my knee. If you are sore after practice then yoga is a great way to speed up your recovery time. But don’t over do it. Some yoga classes are too intense and with other people around you can overstretch trying to compete with others. I do yoga every day and only for about 15 minutes. That’s enough. I don’t do yoga for exercise. For exercise, I do body weight exercises like push ups, pull ups, leg ups, squats, box jumps, etc. And I suppose you could say the jiu-jitsu and judo I do is exercise too, but that’s not why I do it. I do it because it’s fun. Yoga is something I do for maintenance. It’s like brushing my teeth. If you want to reduce your recovery time and not feel sore and stiff the next day then do yoga, but take it easy. I don’t actually suggest a class for that. I mean you can take classes like I did in my first year to learn, but choose wisely as some are pretty intense. I think more frequently and less intense is better. That may also be the case for martial arts training in general as Firas Zahabi said. For balance I think you need something soft to complement the martial arts. Jiu-jitsu, judo, MMA, etc. are all hard on the body. If you exclusively do hard training all the time you will burn out and your body will fail. Take it easy and take care of your body. Yoga isn’t just stretching and yoga isn’t yoga if you are not doing the breath work. In jiu-jitsu you can find yourself in a lot of tough positions where you can easily freak out or panic. But that is not going to help. You need to focus on your breath, be patient and then maybe you can get out of that terrible position. But if you panic you will gas out and probably have no chance. The practice of deep breathing will also improve your cardiovascular system. Your breath controls your mindset. Take deep steady breaths for an extended period of time and notice how it helps control your mind and body. Light yoga and/or meditation with a focus on your breath can help ease the anxiety that fills your body before competition. Here’s a simple technique to ease your nerves. Place your hands on your stomach and then breath in for a 5 count and expand your belly. Pause for a 5 count. Exhale for a 5 count and contract your belly. Pause for a 5 count. Or do some yoga and focus on your breath. Activating your body somewhat might be an even better way to calm down whether you are preparing for a competition or dealing with general anxiety. If you injure something your body can get out of whack. It might lose proper alignment or function. Yoga is a way to activate muscles that may be out of balance, tight or out of shape. I think a lot of benefits come from cross training. If you train exclusively in one domain you may become one dimensional and parts of your body may get out of shape or suffer from over use. Any other reasons you should do yoga for martial arts or jiu-jitsu? 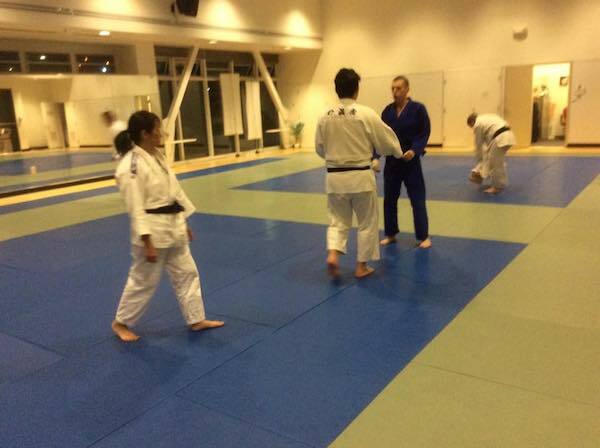 So I have been in Fukuoka, Japan for a few weeks training jiu-jitsu and learning Japanese. It’s going good. I started training at a new dojo called Axis jiu-jitsu Fukuoka. It’s a nice small space near Ohori park in Fukuoka. It’s fun training at a new place too. I chose this place basically cause it was the closest place to where I live which is like 7km away and the owner let me train there on my first day for free. Before that I went to a couple of other places in the city to check them out. The first place said there was no free class and that it would be 2,000 Yen which is about $20 and if I wanted to train for a month then it would be 20,000 Yen. I had already done some research on places around Fukuoka and knew a few were around 10,000 Yen a month which is about $100. I went to the next place and they seemed more friendly. They didn’t invite me for a free class, but said it was 10,800 Yen. I was thinking that maybe things in Japan were different with no free first class. So then I was thinking of going to another place, but just decided to go to Axis jiu-jitsu since that was closer anyway. When I did the teacher Kanda invited me to the mat when I walked in the door for free. So after class I rode my bike home and pretty much decided that was where I was going to train at. And that’s where I am now. Some customs remind me of my first school in San Fran, Romulo Melo as everyone seems to shake hands when they greet each other on the mat. Maybe that is a Gracie thing I don’t know. It’s nice to be able to train everyday too. I hurt my knee, but other than that the vibe seems mostly pretty relaxed too. More on Axis jiu-jitsu in Fukuoka. These 2 jiu-jitsu moves are dangerous and I do not recommend doing them. Both of them are illegal in judo and they are also illegal in some situations, competitions or belt colors in BJJ. I have received a knee injury from both of these moves and you will see one of them in the video below. I can tell you that you will not want to be on the receiving end of one of these moves gone wrong. It’s not that they always cause injury, but it’s that they often enough cause injury and when they do it’s often serious. When I lived in San Fran there was one purple belt there that did this to me. I didn’t get an injury, but it was close enough and very sketchy feeling. Then like 4 days ago or so I was sparring with a new classmate here in Fukuoka standing up trying some throws when the next thing I know my knee turns in and I feel it pop. I hit the ground and I am in pain. My opponent was around 220 I’d guess and tried a scissors throw, but I didn’t know that until I saw the video. It’s dangerous and not worth it. You can see how my knee looks in the video above. Fortunately it could have been worse. I don’t know what happened to it, but I would guess that it is was a minor MCL tear or it just got stretched. Minor MCL injuries usually heal on their own. I got one in my other knee like 20 years ago snowboarding. Oh, and it’s NOT just me. And of course I think that now because I got hurt from it. And well anyone that does judo probably also thinks that. You would never do this in a street fight, probably never if you are smart. And you don’t ever see this in the MMA. Because if you do you are going to get slammed into the ground and punched in the face. Now it’s a move that’s relatively easy to do, but it’s dangerous. Here’s what happened to me back in 2016 or so. I used to go to CCSF in San Fran for judo and jiu-jitsu classes. That day we were doing judo competition practice where you bow, step in, bow and then start going for the throw. But this guy also weighed well over 200 pounds decided to jump guard which is something you can’t do in judo anyways. My mistake my not so compassionate teacher said, haha was I was going backward. And I wasn’t on my toes. So he jumps guard and lands on my knee. He never made it to my waist. It hyper extended my knee backwards. If you weigh 50 pounds more than your opponent you definitely don’t jump guard. It was really painful and the MRI said I had a bone bruise and a torn meniscus. I was out for 2 months. This is not only me. And you will see some nasty looking injuries like the one in my video above. You have to consider your training partner. You can’t just do a “hail mary” move and hope that it will work out because your partner is going to suffer like I did. Do you want someone to do that to you? If you’re a big guy or just bigger than your partner then you need to respect the difference. It’s possible to do these moves correctly so that you do not hurt your opponent, BUT how often do you do moves 100% perfect? Let’s say you are good at arm bars from the mount and you do one 90% perfect and smooth, but you hit the guy in his head when you bring your leg over his head. That’s no big deal because your partner might just get a bump or bruise. But for these moves if you are just a little bit off and/or your opponents position is too then that can lead to a terrible knee injury. Don’t bother with either. There are plenty of throws and take downs out there to learn. More on training at my new school in Fukuoka. 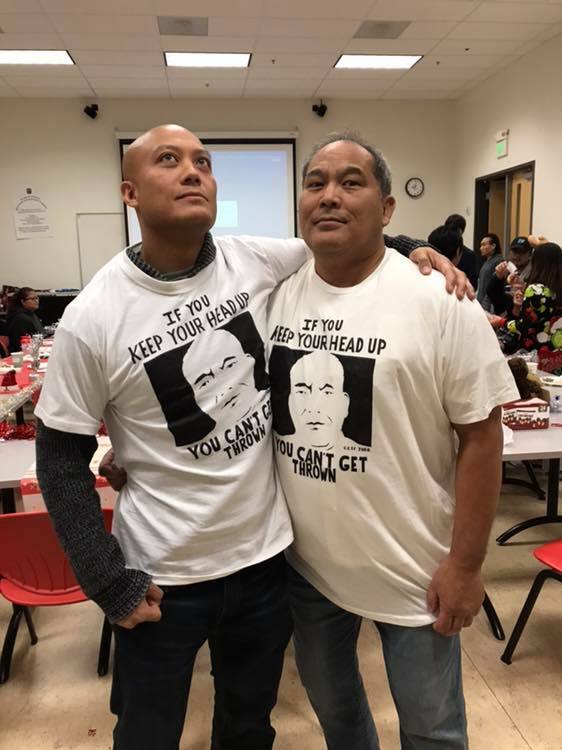 Haha, this was a funny photo from the CCSF Christmas party, 2018. I made those shirts. I made it for sensei. I remember that he said that once and I thought it was cool. He might have been describing a specific situation, but I thought it also sounded cool figuratively. I made another and added it as a random gift in the party. I am happy that Robert chose it. I did a drawing of sensei that I found on Facebook on a piece of poster board. Then I made a stencil and stenciled it with a fabric marker onto a T-shirt. It’s kind of low-tech and a bit wabi-sabi. Not sure if he really liked it, but some people seemed to get a kick out of it. So along with another classmate I got promoted from green belt to judo brown belt. 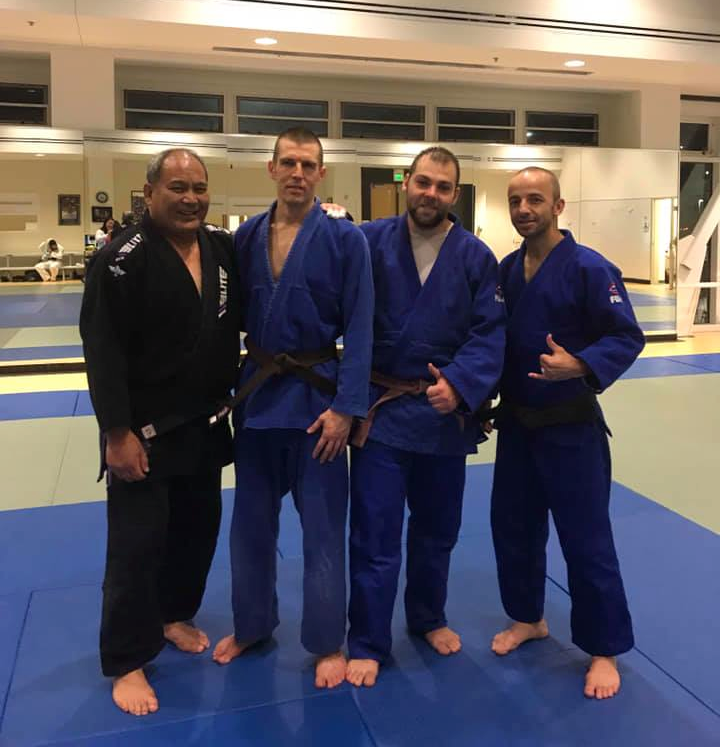 This last Tuesday I got promoted to judo brown belt. Nothing feels different though. I still feel like a white belt. Sensei says that it is hard to see your own progress cause everyone else is progressing too. In promotion everyone lines up and gets to do 3 free throws. You don’t fight you just let them throw you. It’s practice for falling, but it is a lot of throws. Getting thrown anywhere from 45-60 times in maybe 10 minutes. I sort of dreaded it at first because I remembered last time, but it’s not so bad. Some throw hard, but many don’t. Progress seems slow, but belt promotion is faster than jiu-jitsu. From what I read I think averages for judo might be close to 5 years from white belt to black. In jiu-jitsu the average is about 10 years from white to black. I don’t do a lot of judo. I do about 2 days a week and have done so for around three years. Though in the beginning I didn’t do much randori just technique. 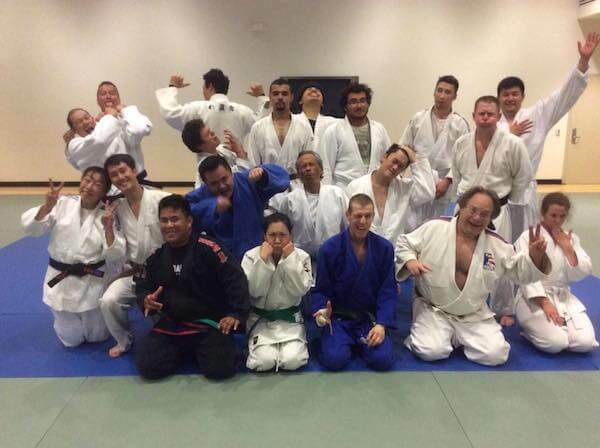 I got the photo from CCSF’s judo page. Judo vs. BJJ for self defense? Which is better for self defense? Judo or Brazilian jiu-jitsu? I saw this question on Quora and I had to add my two cents. There are some potential advantages and disadvantages to both and in this post I will explore them both as best as I can. But first off know that you can’t learn any one overnight, in a couple of weeks or even a few months. I mean you can learn techniques, but how deeply will you learn them? Will they be instinctual under pressure? You need time and a lot of repetition. Judo could be good for self defense as it evolved from Japanese jiu-jitsu. But nowadays judo is more focused on throws. In its past it was the full grappling program with newaza (ground grappling), tachi waza (standing) and leg attacks. But the rules to judo changed because it was boring to watch ground grappling on TV. It was more fun to watch people getting thrown. Then 4 or 5 years ago they banned leg attacks so you can’t touch the legs. So for judo it’s going to depend on the dojo. Many are going to spend most of the time doing stand up techniques. But for self-defense you want to learn both stand up and ground grappling. So if you choose to go the judo route and you want to learn it for self defense choose a school that spends a lot of time with newaza. The potential problem with judo is that you won’t learn enough ground grappling. I have only trained judo at one school, CCSF. The intermediate-advanced classes are now 100% stand up. Sensei used to teach some basic newaza in those classes, but now he says if you want to learn ground grappling to go to the beginners judo/jiu-jitsu or intermediate jiu-jitsu classes. The throws work though even without a gi. In fact I will tell you a story below related to that. But if you are curious here is a cool video that shows judo throws being done in MMA. BJJ evolved from judo, but not the modern day judo you see on TV. BJJ is primarily a ground grappling martial art. The goal in BJJ is to basically submit your opponent. It’s good for self defense, but it has a weakness and that is that it is mostly focused on the ground. If you don’t learn how to take your opponent down then you’ll never be able to apply what you learned in ground grappling. The potential problem with BJJ is that you won’t learn how to take someone down. I’d say most BJJ schools will spend 90-99% of the time on the ground. For example, the first school that I learned at probably spent 95% or more of the time doing ground techniques. Judo has a lot more rules and formality than does BJJ. BJJ is basically about submitting your partner. Judo contests are mostly about throwing your partner and getting him to land flat on his back, ippon! But judo sparring matches start standing up which is more like a real fight. BJJ sparring usually starts on your knees. Contests start standing up, but in class you usually start on your knees or sitting which is not like a real fight. A submission can win the contest too, but only black belts can do arm locks in competition. Lower belts can only do chokes. Keep in mind either way the rules applied to either one don’t apply on the streets. The same goes for MMA. While in MMA you can kick and punch you can’t kick and punch everywhere or attack the groin or eyes which could be done on the street. Also on the street someone could try to bite you too right when you are about to arm bar them. So keep that in mind. I had an altercation once where this freaky street guy probably on drugs without shoes or a shirt came by and tried to steal my money. I was able to use what I had learned from both judo and BJJ to stop the fight and control him until the cops came by. Here’s a video about that or you can read and watch it here. So which is best? BJJ or judo for self-defense? I’d say both. Learn both if you can or choose a judo dojo that has a good newaza program or a jiu-jitsu program with good takedowns or throws. Commit to a year for starters. That’s what I would do. It’s easy to quit after a month or two and like I said you won’t really learn or remember much in a month. That might be good, but as far as I know the sparring element is missing which can be common in some other martial arts. The first martial art I did was wing chun. It was kinda cool, but I thought it was overly mechanic and everything was staged – there was no sparring. Sparring is important. And judo and BJJ both have live sparring. There are a lot of martial arts that could be effective. It just depends. What a day. Some crazy homeless guy possibly on drugs tried stealing my money as I was street performing on Grant in Chinatown, SF. I do a hybrid kinda street performance that entails a costume (see the latest), some miming, story telling, goofing around, and beatboxing. I divided this post into 2 parts as there were 2 altercations with this same guy within maybe 10-20 minutes. So I was sitting out on Grant St. in Chinatown doing my pink man show and waiting for someone to push play. Then this guy who wasn’t wearing a t-shirt or shoes comes by and picks up my money can sitting between my legs and starts walking off. At first I thought is this guy joking? I told him to stop and he kept walking. So I threw him with a judo throw. It happened fast and I can’t remember what kind of throw it was, it was something like osoto gari or o guruma or harai goshi. That was my mistake. He got up hit me in the side of my temple and than ran over to a store across the way and grabbed a bin of umbrellas. Then he tried throwing them at me and eventually ran off. Luckily most people are good people and a few people collected my money that had flown everywhere and watched it while this was happening. Weird too, after that the woman who works next door gave me $20 and another guy $5. It’s weird how that works. The same thing happened another time when a guy was being a jerk throwing these loud firecrackers near me and then I got angry and went over to him and said some things. Maybe people like drama or maybe it’s compassion. Maybe some people feel a sense of compassion for this pink or blue dude who people are messing with. He started saying I took some of his stuff. This guy was crazy. He wouldn’t go away and kept walking around me. This time I took off my sign that I wear. Then he took his shirt off the ground and started whipping me with it. This is all happening on the sidewalk and middle of the street. There was that thought (a moment) of, “do I back off or attack?” I actually attacked him and grabbed him and got him up against a car from behind in a rear naked choke. But his chin was tucked and I couldn’t finish him. Later I thought how I could have got that choke… more on that later. Then another guy comes and asks if we could get off the side of the car. So I threw the guy again on the pavement and got on top of him. He was pulling on my shirt and pushing towards my face. I was going for the americana. I was thinking of a choke, but he had no shirt on and I’m less confident about my arm triangle chokes. So I went for the americana. The guy is fighting, but eventually I got his wrist to the ground. I kept my elbow by his head to keep him from biting me. I was thinking this guy could bite, try grabbing my balls or any other dirty thing. Once I got my grips I pulled it down and up toward his hips. Then I heard some pops and cracks in his shoulder or elbow, the guy yell and then suddenly he became limp and apologetic. “I am sorry”, he said. If I wanted to be mean or really destroy his elbow or shoulder I would have done it again even deeper. But he stopped fighting and started saying sorry. So I just held him there in that arm lock. I was thinking, “do I let him go or hold on or what?”, but I held on, the cops eventually came and handcuffed him. I guess he was causing problems up and down Grant. So that’s my story about using judo and jiu-jitsu in a street fight. I always wondered if it would work. I mean it should right? I had been training in jiu-jitsu for maybe close to 3.5 years frequently and in judo for a few years less often. But you never really know until you are in a fight. Even after part 1 I was thinking about that mistake and well like most things in judo or jiu-jitsu there are no mistakes. There are only learning experiences. You may have heard that if you have been practicing jiu-jitsu. It may sound cliche, but it’s the truth. And I got the chance to immediately apply what I had learned from the first episode. I knew this guy was a problem when he came back so I took my sign off. He took his shirt off the ground and was whipping me with his shirt and then I attacked. In the end I submitted the guy until the cops came. But learned a few things along the way. Don’t just throw the guy and think the fight is over. Get on top and/or submit. I think I could have gotten the rear naked choke had I used my other bicep on his fore head to open up his neck more for my other hand. Probably hard for some to visualize what I mean. Be aware of your vulnerabilities because the guy may try the dirtiest stuff. It doesn’t matter if it’s a real fight, rolling at the gym or a competition. The same sort of reflection happens every time you roll with someone. When you fail you can look back on what you did and think about what you will do next time. My performance glasses got f*cked up, I got a bump on my temple from getting hit, scratch on my forehead and a bruise on my knee – mounting on the pavement is a lot harder than a mat in the dojo, but otherwise I am o.k. I noticed that guy had a bloody hand when I had him in an arm lock and I am pretty sure by the sounds of things mentioned earlier that something tore or broke in his elbow or shoulder. I didn’t punch or kick him I just did what I learned. I wanted to get a video because I saw some people recording it, but left by the time the altercation was finished. So hopefully one will surface on Youtube or somewhere else that I can use in the next week or so. Seeing some pink street performer dude fighting on Grant Street in Chinatown, San Francisco is a little unusual so maybe a video or two will surface somewhere. Before I got into jiu-jitsu I heard people talk about how it can make you more confident. I always wondered if it had made me more confident. I still don’t know, but had these things happened 4 years ago I think the outcome may have been different. The cops were actually pretty cool to me which was surprising considering I had known one of the cops for a long time. I think that same cop seems to respect me more now for whatever reason. I got promoted to green belt in judo yesterday at CCSF. And I am being a bit sarcastic when I say “pleasure”. When you get promoted there is a certain sort of ritual and part of the ritual is that you line up and get to throw the people who got promoted 3 times – once for yourself, once for the teacher and once for the person promoted. Last week Jackson got promoted to 3rd degree brown belt. I thought it looked a little brutal when I saw some people throwing him pretty hard. I was thinking that maybe that treatment was reserved for the higher belts and maybe newly promoted green belts wouldn’t get thrown. The four of us promoted got thrown 3 times by each classmate (16 classmates). So that means we got thrown 48 times in about 10 minutes or so. This isn’t like randori. You have no fair chance. You just have to accept it. You let the other person throw you. And some won’t throw you that hard and others will. I was a bit worried about that. The four of us in the front row were promoted to green or brown belt. 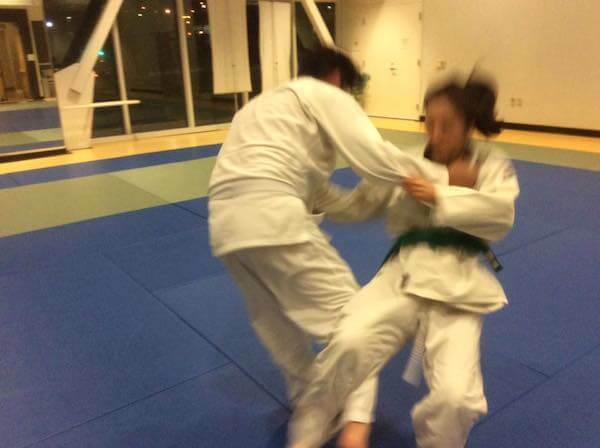 I have been practicing judo since around 2015. I started with jiu-jitsu and gradually got into judo. I didn’t take it as seriously as jiu-jitsu and didn’t practice as much, like 2 half classes a week. I realized that it was important to learn judo because if you don’t know any take downs or throws then how are you going to get your opponent to the ground? So from a self-defense perspective I think you have to know some judo to be a better grappler. I didn’t really do a lot of randori (sparring) with judo. I would often go to jiu-jitsu Tuesday and Thursday at 6 and then stay for the first hour of judo which follows jiujitsu. I would do some technique and then go home. Then I tried to add a little randori with a few people before heading out. And I recently started to stay a bit longer to do some more. Learning to fall is part of it too. I try to work on my falling. Sometimes it’s fun to fall like when you have it timed right and you break the fall with your arm(s) just right. Other times it’s not so fun especially when you don’t see it coming or you get the wind knocked out of you. The photos are from the CCSF judo page.